Gordon T. Smith provided a theological rationale, in the ‘Unity not Uniformity’ conference, for an ecumenical reality that many evangelicals are already experiencing in various ways. Christians around the world observe the Week of Prayer for Christian Unity each January. This year the Week fell on the 18th to the 25th, and I was delighted to prepare myself for it on the 16th and 17th by joining more than 100 other people, representing about a dozen congregations, at the Unity not Uniformity, Diversity not Division conference, organized by three Protestant congregations in Richmond. Proximity, personal connections and a shared eagerness to explore common mission in southwest Richmond led Jonathan Coutts of Richmond Alliance Church (Christian & Missionary Alliance), Micah Smith of Emmanuel Christian Community (independent, with Brethren and charismatic renewal roots) and Albert Chu of The Tapestry (Christian Reformed) to co-sponsor the conference. Coutts came up with the idea for the conference 15 months ago and brought it to Smith, with whom he had a friendship and a shared background in the Alliance. 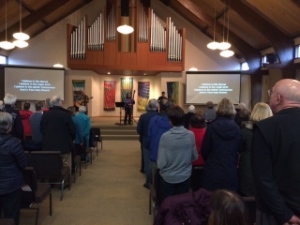 Coutts made most of the initial arrangements for the conference – including securing the speaker, Gordon T. Smith, who is Micah’s father and currently president of Ambrose University (Alliance and Nazarene) in Calgary – before ending his pastorate at Richmond Alliance last June. Micah then needed a new partner for the initiative and reached out to Albert at The Tapestry, since they were nearby and one of Micah’s predecessors from Emmanuel is now on staff there after ministering in Malaysia. I asked Micah and Albert why it is important at this time and in this place of Richmond and the Metro Vancouver region to “spark interest and encourage healthy unity between different traditions of the Christian faith” (to quote from the conference poster). For Micah, it is primarily a theological conviction: we have one Lord and are one body. Micah has lived in several Christian traditions and has been deeply influenced by a broad range, even to the point of drawing liturgically from them now as a pastor. He does not want to merge all Christians into one tradition, much less call for the end of denominations. Rather he wants to push against denominationalism by affirming the goodness of multiple denominations. Albert shares Micah’s theological conviction and points to the fact that The Tapestry’s parishioners and pastors come from a wide background. At the same time, he underscores the need for pragmatic effects of engaged unity. The West Coast has always been at best indifferent to Christianity, and Canadian culture is becoming downright antagonistic to it. The number of congregations and self-identifying Christians continues to decline, while poverty and social injustice increases around us. Despite, or perhaps because of, massive immigration, there is very little dialogue or collaboration between churches of differing ethnicities and languages. Local churches need to move beyond joint Easter services and monthly ministerial meetings to cooperate on more substantive issues of mission. Both Micah and Albert speak well of the ministerial in Richmond that was led until recently by Bill Armerding and now is led by Jenny Han of New Joy Church. Jenny is newly hired as a full-time prayer coordinator tasked with facilitating pastors and churches in Richmond to come together to pray for each other and the city. To promote concrete opportunities for shared mission, the conference ended with workshops on evangelism (presented by Bill Hogg of the C2C Network), persons living with disabilities (Richmond Society for Community Living), and persons struggling with low income (Richmond Poverty Response Committee). The conference centred, however, on three presentations by Gordon Smith which outlined an evangelical Protestant case for an ecumenism that includes Catholics and other mainline traditions. He began with an appeal to scripture, explaining that the New Testament everywhere teaches there is only one church and that this truth is foregrounded particularly in Ephesians. While we have many reference points, then, for the unity of the church, Smith went on to highlight three. Three Richmond churches sponsored the conference. All Christian traditions have a common, shared baptism in the sense that none of us were baptized into our denomination but into Christ; we were baptized not in the name of our church but of our God. Second, we have a common gospel in that we share a love for Christ Jesus: we ultimately are one because we have all experienced new life in the same saviour. Here Smith paused to offer stories, which many of us could also tell, of encountering people outside his Protestant evangelical tradition who radiate the love of Jesus and evidence the fruit of the Spirit. But wait! Do Protestants, Catholics and Orthodox truly share a common gospel? Do we not have multiple denominations precisely because we do not agree on what the Bible truly says? Here Smith turned to a third essential reference point for unity – the Nicene Creed. The ‘Bible alone’ cannot hold us together, Smith argued, because a common statement on what scripture is does not resolve controversies of what it means. The Bible must be interpreted before it can have articulate, unifying power over our beliefs and actions. The creed summarizes our faith and guides interpretation. It predates the closing of the biblical canon and indeed influenced the final shape of scripture. The creed does not belong to any one denomination and cannot be modified to fit our preferences. In light of all that we genuinely share, and the biblical command for unity, what are we to make of our strong differences of opinion about substantial matters of doctrine? Smith again turned to scripture to show that theological diversity is the norm rather than an aberration, and that diversity without division brings greater glory to God than sectarian protest. This theological diversity yields a diversity of gifts essential to the life of the church. Taking a cue from Leslie Newbigin’s book The Household of God, Smith reckons that Protestants (who emphasize faith in response to the word), Catholics (who emphasize the centrality of the sacraments and the communion of saints), and Pentecostals (who emphasize experienced effects of receiving and abiding in the Spirit) need one another in order to comprehend and to live out the fullness of the gospel. What does it mean to be ecumenical today? The history of denominations stems from a succession of three major splits: the schism between Eastern Orthodoxy and Roman Catholicism in the 12th century, the Protestant Reformation in the 16th century and controversies between evangelical and mainline churches in the 19th century. Gordon Smith suggests that we remain in the tradition that introduced us to Jesus, but also that we go out of our way to learn about other traditions. On the one hand, we should affirm that each of these traditions is organically linked and remains a true expression of the church. On the other hand, Smith said, amalgamation into a single institution would neither be healthy for the church nor resolve issues of diversity. Smith gave a special warning to Protestants who, like himself, are tempted from time to time to leave their tradition, especially out of a desire for a more spacious orthodoxy. Such a move would ironically increase division within the church, we would be “protesting” precisely when we are actually saying that “protest” is not the right way to go. Instead, Smith said, we should remain in the tradition that introduced us to Jesus. If we are spiritual mutts, so to speak, we should pick one tradition and stick with it. From within our traditions we need to learn from one another, worship with one another and carry out mission together. He recommends we begin by reading books from traditions other than our own, attend a worship service in another tradition at least once a year, pray for the unity of the church and for nearby congregations, and work side by side with other churches for the kingdom rather than for congregational or denominational advancement. In his final presentation, Smith gave an evangelical response to Vatican II, which celebrates its 50th anniversary this year. Smith completed his PhD at a Jesuit university in the Philippines and has been deeply struck by the vitality of worship and mission in North American Catholic parishes. Smith is among the many who see Vatican II as a watershed innovation within Roman Catholicism. The full impact of its fundamental shifts is just now beginning to be felt under Pope Francis. I’ll mention here just three of the six key features of Vatican II that Smith highlighted. The document Die Verbum (‘The word of God’) re-evaluates the relationship between Tradition and Scripture. The Bible is once again central to Catholic theological enterprise, the devotion of the Church, the formation of priests and above all to preaching and sacramental worship. Second, the document ‘Baptism, Eucharist and Ministry’ makes the staggering move of affirming the baptisms of non-Catholics and refers to non-Catholics as “separated brethren.” Vatican II resulted in a remarkable commitment to dialogue with other Christians. Smith reckons there are currently 25 or 26 formal conversations between the Vatican and other denominations. Third, Vatican II called for the myriad Catholic religious orders (e.g., Franciscans, Benedictines, Jesuits) to recover their original ‘charisms’ – the particular spiritual gift each order was meant to bear into the church and the world. Over the decades this has fuelled an eagerness outside Roman Catholicism for drawing on the wisdom and strength of these orders – not least among evangelicals who are now teaching courses on prayer and spiritual disciplines. An evangelical response to Vatican II, suggests Smith, would first of all not adopt the posture of judge or critic, as if evangelicalism is the gold standard. Evangelicals must move past parsing out how Catholics are and are not like them, and focus instead on how evangelicals and Catholics can learn from each other and from Vatican II. The primary point of discussion and disagreement is no longer Scripture versus Tradition or Faith versus Works, but rather ecclesiology. What does it mean to be church? Smith notes that this question is the biggest gap right now in evangelical thinking. Finally, Smith admires the ‘new evangelization’ that is galvanizing Catholics to freshly proclaim the gospel. It is difficult to judge how controversial Smith’s arguments were among those who attended the conference (largely evangelical, Reformed and Presbyterian). The question and answer periods following each of his presentations were relatively brief, uniformly cordial and tended to draw out further implications of Smith’s arguments rather than challenge them. 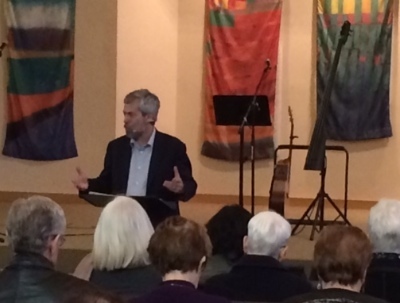 My sense of the conference’s audience, and of Vancouver evangelicals generally, is that Smith was articulating an ecumenism that many – maybe a majority of us – know experientially, even if not intellectually. Perhaps, therefore, the greatest value of Smith’s presentations and of the Unity not Uniformity, Diversity not Division conference lies not so much in how they give theological permission for greater institutional cooperation as in how they validate and clarify an informal movement already well under way. Jonathan Bird is executive director of CityGate Leadership Forum. ← Around Town: Welcoming Light, engineers and archaeologists . . .